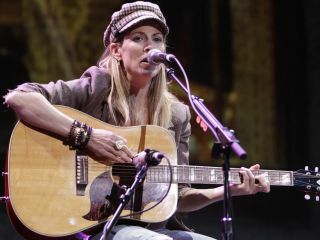 Sheryl Crow pays tribute to the late Michael Jackson, one year after his death, on her upcoming album, 100 Miles From Memphis. The country-rocker's new record has more than a little R&B flavor to it, and certain to be a stand-out cut is Crow's version of The Jackson 5's I Want You Back, which Crow describes as "a sort of homage." Talking to the BBC, the 48-year-old singer-songwriter and multi-instrumentalist said, "Like so many other people, I didn't really weigh the importance of his presence until he was gone. The Jackson 5's ABC record was the first album I ever owned, and Michael ended up giving me my first gig as a back-up singer." 'Tis true. During Jackson's Bad Tour, which ran from September 1987 to January 1989, Crow was a backup vocalist, and even shared the spotlight with Michael (as seen in the video below - dig that big hair!). Despite the feel-good nature of I Want You Back, Crow said, "It was a bitter-sweet moment for me to sing that song with the experience that I'd had with him."